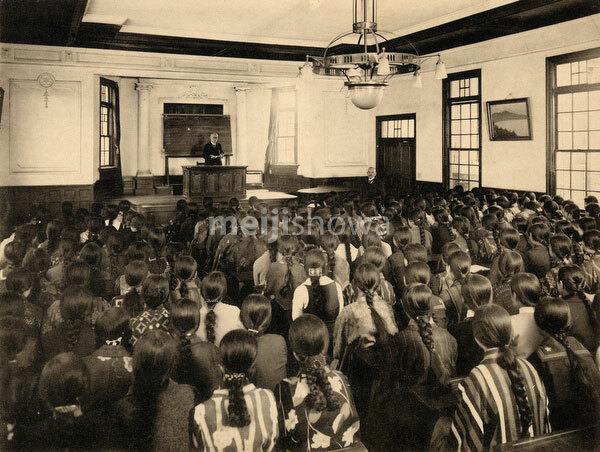 Lecture at Miwada Girl’s High School (三輪田高等女學校) in Kudan-kita, Tokyo, 1928 (Showa 3). The school still exists and is now known as Miwada Gakuen (三輪田学園中学校). The school was founded in Matsuyama, Shikoku, in 1880 (Meiji 13) by female educator Masako Miwada (1843-1927, 三輪田眞佐子), but moved to Tokyo in (1887 (Meiji 20). A scholar of the Chinese classics (漢学者), Miwada was among the first to promote education for girls.